The University of Minnesota’s McNamara Alumni Center recently unveiled Discovery Nexus, a new center designed to spur innovation, collaboration, and commercialization of discoveries emanating from the institution. The university wanted to use technology that would create a “wow” experience and facilitate collaboration, storytelling, and the pursuit of excellence. Discovery Nexus features collaboration stations, meeting and presentation spaces, and an immersive 15-by-7-foot curved theater display. “We were looking specifically for an immersive technology that engaged the viewer, and only NanoLumens could provide the type of all-encompassing video experience Microgigantic envisioned,” said Mark Bennett, CEO and founder of Microgigantic. In addition to the experience design, Microgigantic spent 30 days over the summer producing aerial drone cinematography and interview-based storytelling that envelopes the viewer. Discovery Nexus features collaboration stations, meeting and presentation spaces, and an immersive 15-by-7-foot curved theater display. 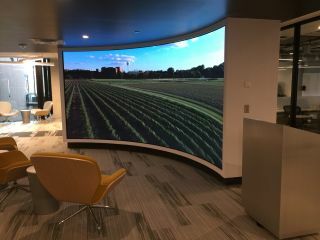 To maximize the impact of the second-floor entry space shared by five different departments, the design team envisioned a curved wall hosting the giant immersive display. NanoLumens Nixel, a roughly 6-by-10-inch LED panel, combines seamlessly to create displays of nearly any size, shape, and curvature. The team agreed on a 2.5-milimeter pixel-pitch definition to assure the viewers, who sit about 12 feet from the display, would not discern individual pixels. “We basically maxed out the space,” said Vince Cerniglia of Tierney Brothers. “The display goes nearly from the floor to the ceiling. It affected other parts of the renovation, such as the plans for a frosted glass wall on an adjacent conference room. They decided to go with clear glass instead, to show off the NanoLumens display from every possible angle.